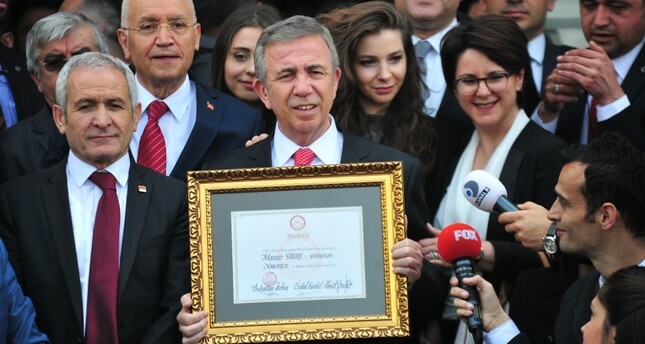 Main opposition Republican People's Party (CHP) candidate Mansur Yavaş was awarded the certificate of election on Monday to become the mayor of the capital Ankara by Turkey's Supreme Election Council (YSK). Yavaş was elected mayor of Ankara metropolitan municipality in the March 31 local elections in Turkey. The ruling Justice and Development Party (AK Party) had challenged the results from the local elections in the Ankara, but a recount showed that Yavaş maintained a lead of about 124,00 votes over AK Party's candidate Mehmet Özhaseki. On Sunday, the YSK rejected the AK Party's request for a full recount of all votes in 13 districts in Ankara. YSK head Sadi Güven told reporters at a news conference Monday morning that the judicial process in disputed districts is continuing, underlining that making an evaluation is "not possible" as the process continues. AK Party Deputy Chairman Ali Ihsan Yavuz on Sunday said the party applied to the YSK for a full recount of votes cast in 38 districts of Istanbul, where CHP candidate Ekrem Imamoğlu maintains a narrow lead over AK Party candidate Binali Yıldırım following a partial recount. On March 31, millions of Turkish citizens cast ballots in the local elections to choose mayors, city council members, mukhtars (neighborhood officials), and members of elder councils for the next five years.